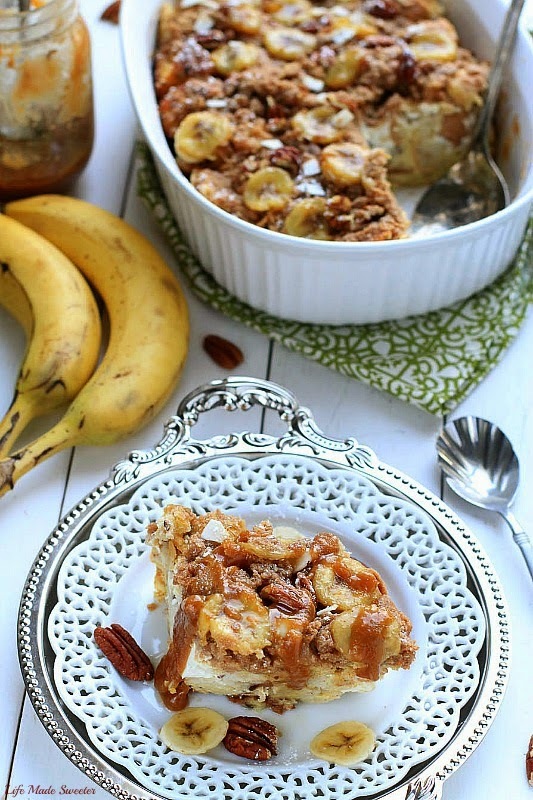 Overnight Banana Pecan Streusel French Toast Bake is the perfect easy breakfast or brunch. Best of all, it’s easy to assemble the night before. 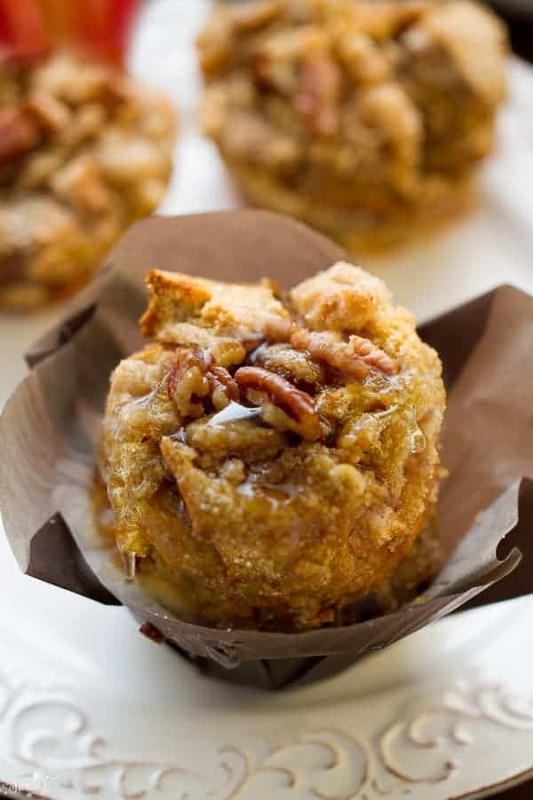 Made with a creamy banana filling topped with a cinnamon, pecan & brown sugar streusel. Weekend mornings are my favorite. You’re not rushing to get up early and fix breakfast and everything just seems a little bit more calmer. You can also shake up your breakfast routine with something other than a regular bowl of oatmeal. That’s where overnight casseroles come in. They are just perfect for making ahead and are always a hit with guest. This Blueberry Cream Cheese French Toast Bake and Strawberry Cream Cheese French Toast Bake are also ones on our regular rotation. 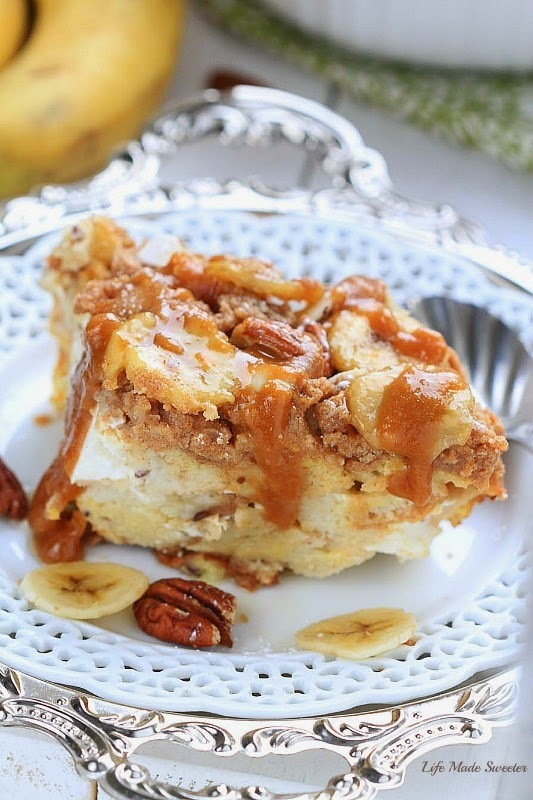 Our latest obsession has been this Overnight Banana Pecan French Toast Bake. It makes a special breakfast for a random weekend and perfect for when you’ve got overnight company. It’s got a layer of sweet bananas stuffed in the middle and a creamy filling made with cottage cheese filling stuffed in between. It’s lower in fat and more heart healthy than cream cheese but if you don’t have it on hand, feel free to swap it out for cream cheese instead. My favorite part is that you can assemble everything ahead of time the night before and then just pop it in the oven when you’re ready to dig in. 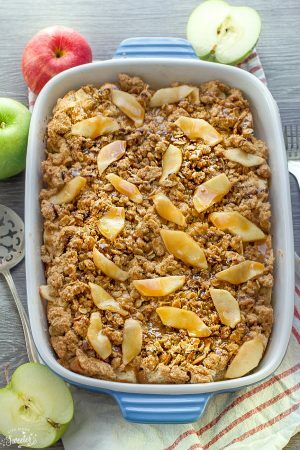 Plus, the sweet cinnamon, pecan and brown sugar streusel topping in the oven is just the best! It will make your house smell amazing the next morning while it’s baking up! Serve it alone with a few slices of bananas and coconut chips or pour on your favorite syrup or caramel sauce for a decadent treat! 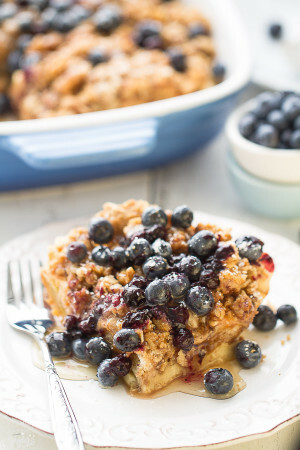 An easy breakfast that is comforting and indulgent and an awesome way to start off your weekend. Mix the egg and milk mixture the night before. Assemble the night before and park it in the fridge overnight to soak up all that goodness. 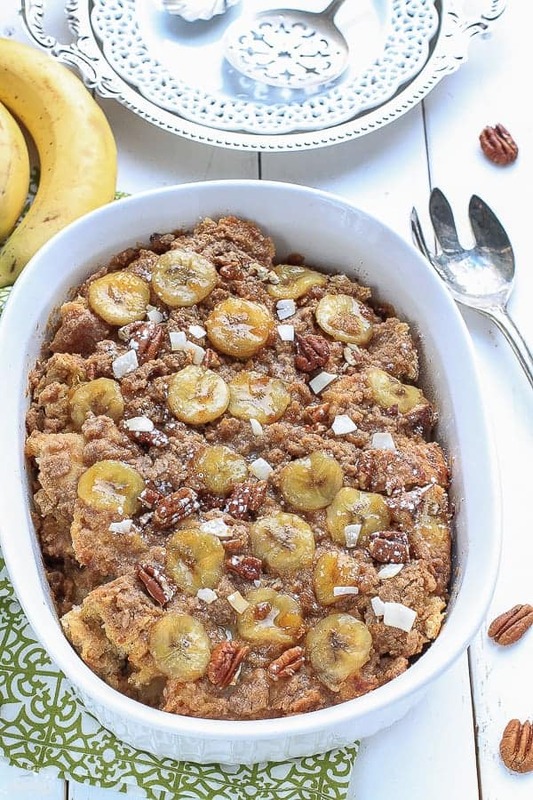 An easy overnight baked french toast casserole with a creamy banana filling topped with a cinnamon, pecan & brown sugar streusel. Wake up in the morning to this delicious and indulgent breakfast. Prep the ingredients the night before and you can pop it in the oven in the morning! Spray a 9x13" baking dish with non-stick spray. Blend the cottage cheese in a blender, food processor, or using a hand mixer. When there is a smooth consistency, mix in the sugar, cinnamon and vanilla extract. Blend in 1/3 cup of milk. Scoop out 1/2 cup of the mixture in small cup or bowl and set aside. Add the rest of the milk and eggs to the blender mixture and blend until smooth. Set aside. Layer half of the bread cubes in prepared baking dish. Add the 1/2 cup reserved cottage cheese/milk mixture over bread cubes. 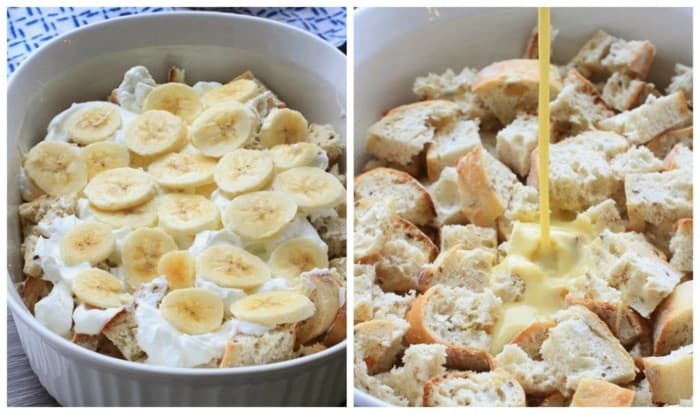 Top with a layer of sliced bananas. Layer evenly with the rest of the bread. Pour the liquid blender mixture evenly over the top of the bread. 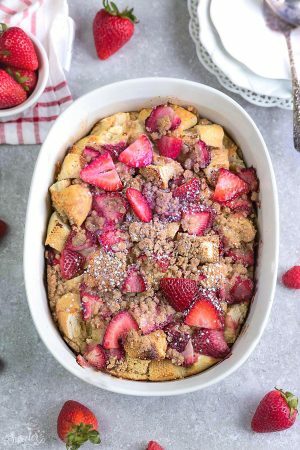 Make the streusel topping - To a medium bowl, add the butter, flour, sugars, cinnamon and using two forks or your clean hands, cut/crumble butter into dry ingredients until small pebbles and crumbly bits form. Mix in chopped pecans if using. Evenly sprinkle the streusel over the bread. Cover baking dish tightly with plastic wrap or foil and store in the fridge overnight or for several hours. When you are ready to bake, remove dish from fridge and uncover. Preheat oven at 350 degrees and bake for 43-52 minutes or until streusel is set and appears to have dried out some. Watch oven time carefully as it may vary. You can try a small bite and if it seems too wet, moist, or under-done for your liking, bake longer. Baking times will range greatly based on type of bread used, baking dish used, climate, and oven variance. Mine was done at 47 minutes. Remove from oven and serve warm with your favorite caramel sauce/syrup or a dusting of confectioner's sugar, chopped pecans, coconut chips or extra banana slices (I cooked the extra banana slices in a pan with some caramel sauce for about 1 minute for extra flavor).